Join us for the 5-star rated Zip Line Adventure. Awaken your spirit of adventure on our 2.5 hour guided zipline experience! You’ll encounter over 3,000′ of zip line and highly-acclaimed aerial challenges while overlooking the wildlife and waters of Bayou Wilderness and Tampa Bay. It’s time to Zip On! From start to finish your feet won’t touch the ground! Want one more? A Leap of Faith can also be added to your tour! 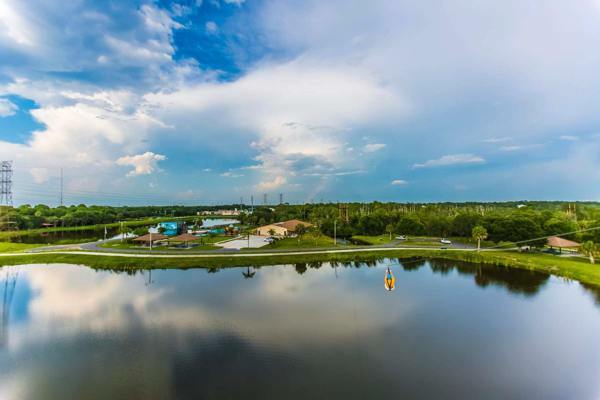 From our zipline course you’ll enjoy a bird’s eye view of the beautiful open waters of Tampa Bay, local wildlife, and everything Mobbly Bayou Wilderness Preserve has to offer. See the 396-acre county preserve in a completely different way.